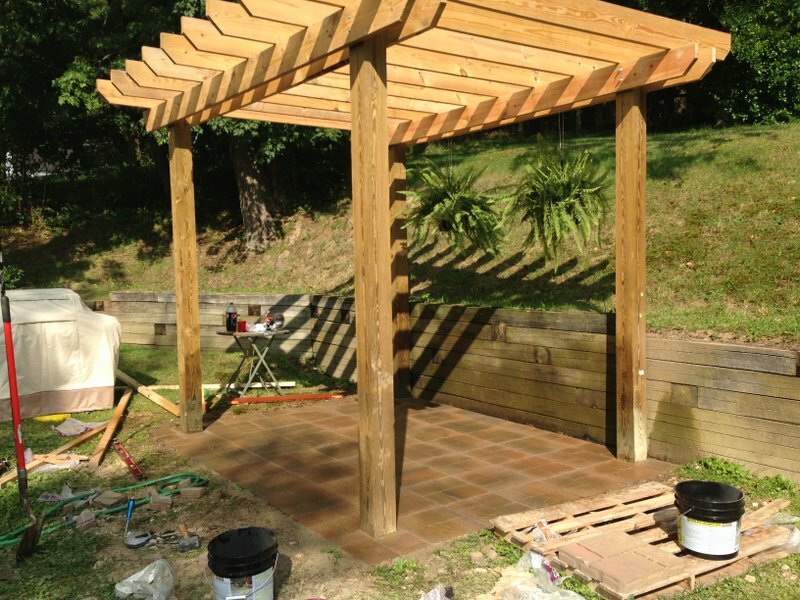 We’ll be laying our paver patio directly underneath our pergola from a previous tutorial; however, you can just as easily follow this how-to for any patio. Just measure the area where you would like to lay your patio and mark the outline. You will want to dig about 2 inches outside of your markings. This will ensure you have plenty of room to work. 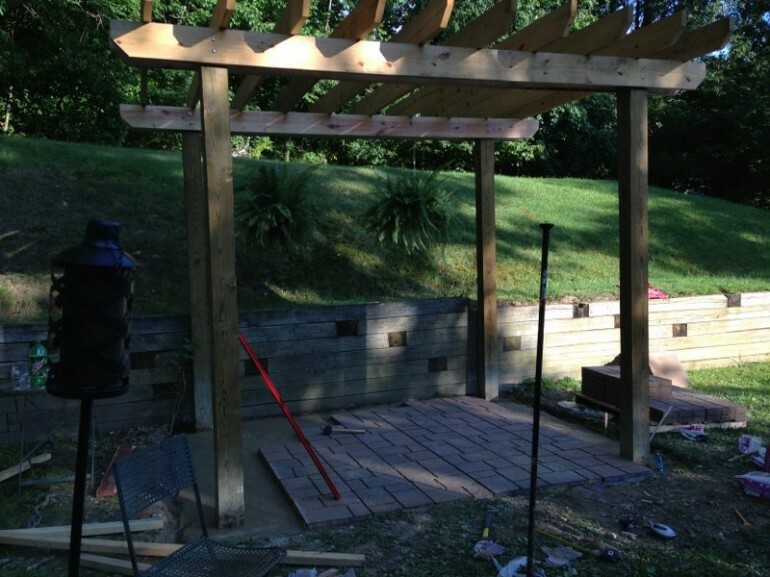 Dig the area for your patio to a depth of 7 inches. If any friends owe you a favor, this is when you should collect. This is definitely the least enjoyable part, but once you get it out of the way you’re smooth sailin. You will need to dig down 7″ because we will be laying down 4″ of gravel as our base, 1″ of sand, and our paver stones are 2″. Once you have dug 7″ down, it is time to add your base layer of gravel. 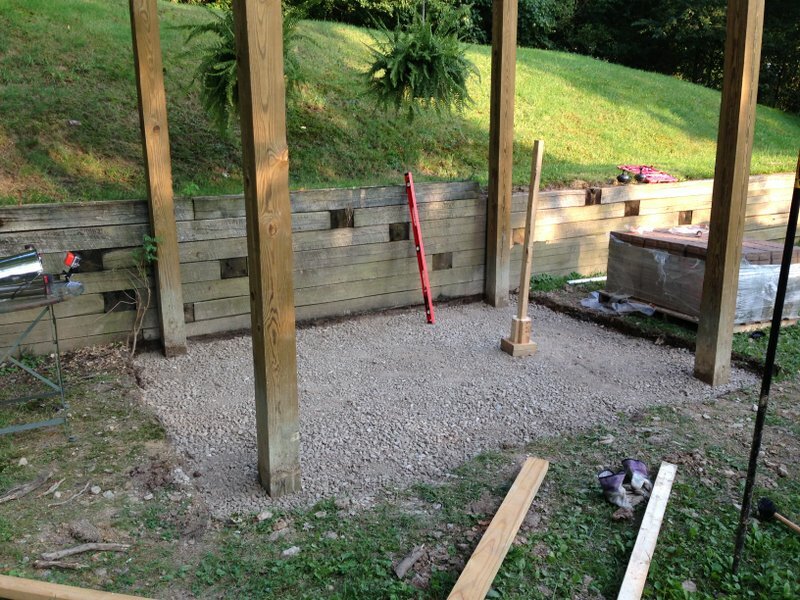 The gravel will provide drainage for the patio. We will want our base layer to be 3″ from the surface and level. Pour your gravel and spread it around. Use a 2×4 to spread the gravel evenly. Once spread out, use a tamper to compact the layer. In this how-to, we used a home-made tamper from a previous project. Once compacted, make sure the base layer is level. 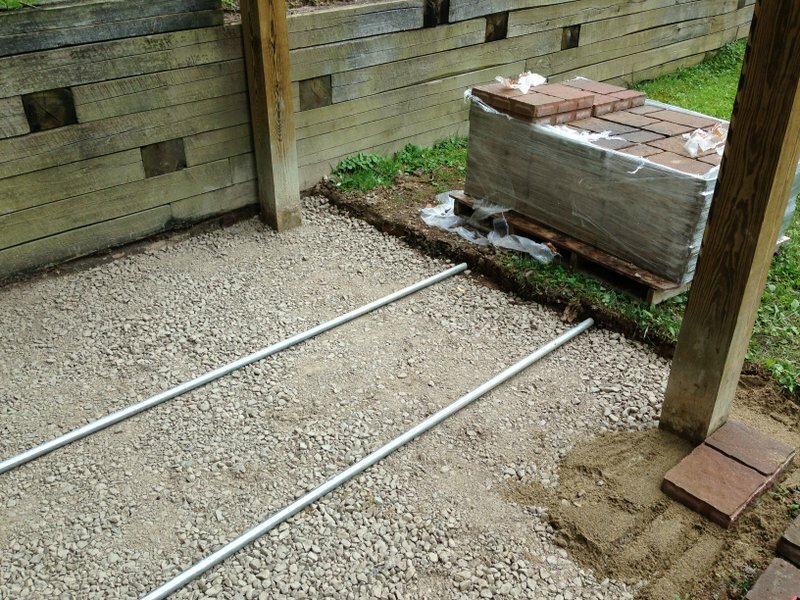 Place a straight 2×4 directly onto the gravel and set a level on top. 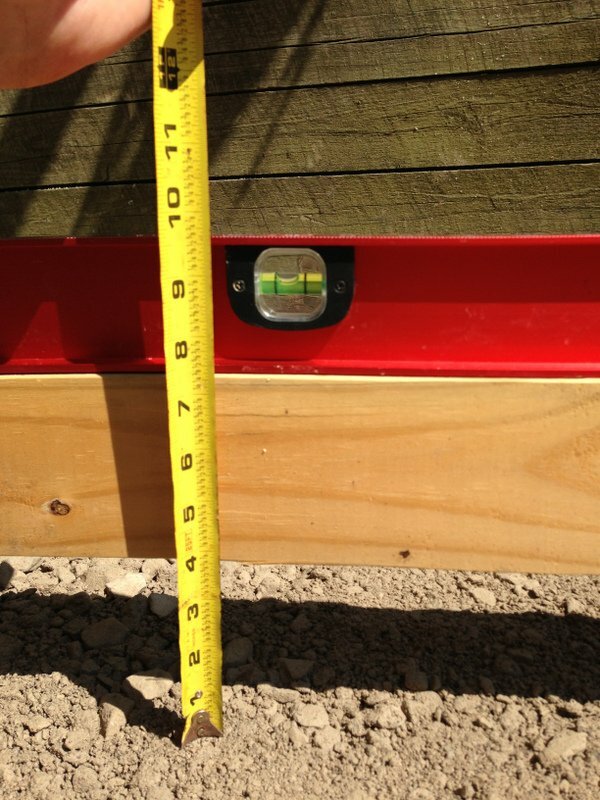 Move the 2×4 around and measure in various different areas to make sure you have a level base all around. Once level, measure the distance from the gravel to the ground in order to determine if more gravel is needed. 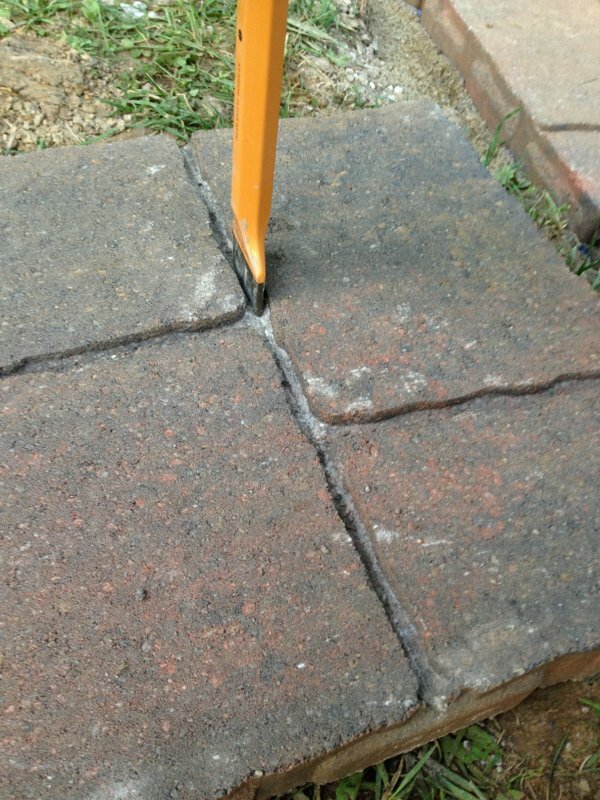 To do this, lay a long 2×4 across the edges of the patio area and measure from the gravel to the bottom of the 2×4. In the image above, we need to add a little more gravel. So repeat the process of adding gravel, compacting, leveling, and measuring until your base layer is 3″ from the ground surface. Now that we have a level base layer to work with, we need to add an inch of sand. 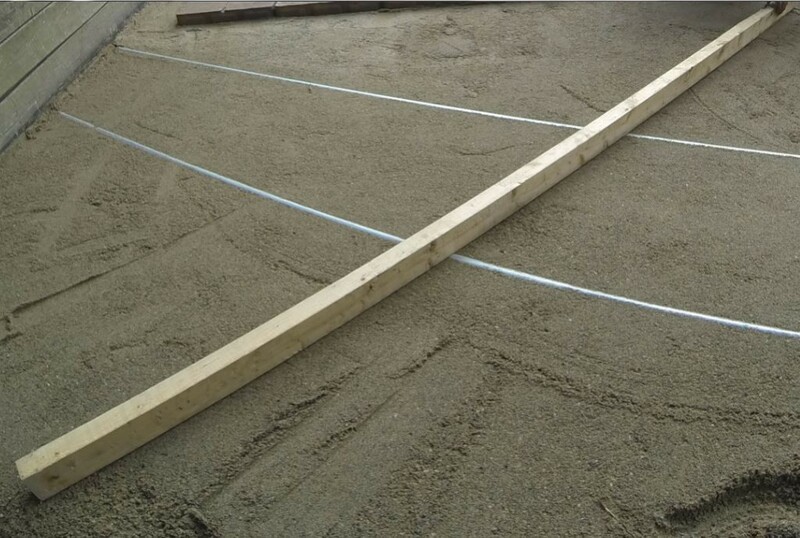 To uniformly distribute the sand, we are going to use screed rails (1″ metal conduit). You can pick up this 1″ thick metal conduit at any major home improvement store. Lay down the 2 screed rails on top of your base layer and spread them apart a bit. You can now pour your sand over the screed rails and all around your base layer. The screed rails will allow us to spread the sand evenly. 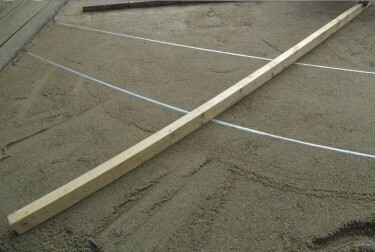 Once you have poured an adequate amount of sand, take a 2×4 and run it along your screed rails. This will start to disperse the sand. You may need to make several passes and add sand in bare spots as you go, but you should soon have a smooth surface of sand in which to place your pavers. Continue working the sand until it is uniformly distributed. Once you are finished with the sand, it’s time for the fun part. It’s time to lay your pavers. This part is pretty self-explanatory. Begin by laying paver stones in one of the corners and work your way down an edge. Once one row of pavers is in place, go ahead and move on to the next row and so on. When you come to a screed rail, remove it and fill in the gap with a little left over sand. You can then flatten the area with a putty knife or a small, flat board. Keep laying rows of pavers until you’re finished up. 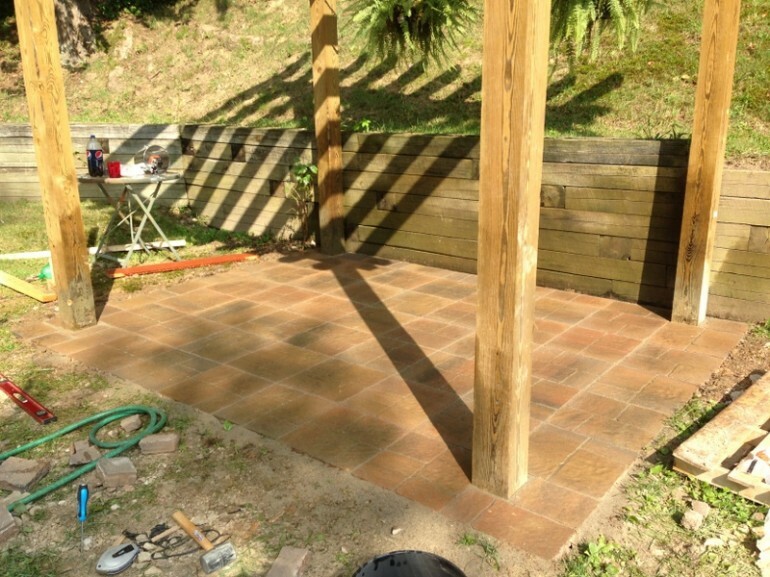 From time to time, place a 2×4 on top of your pavers and make sure you are level in all directions. If you are not exactly level, you can use a rubber mallet to tap the paver and set it. It’s possible you will need to cut a number of stones in order for them to fit correctly in certain spots. There are many ways you can do this, but I believe using a brick chisel is a cheap, easy way to get this done as long as you don’t have a lot of stones to cut. Mark where you want to make your cut. Make your way down your line with your chisel, giving it a good tap with your hammer as you go. You only want to score the cutline right now. Hitting too hard may prematurely break your brick with an uneven line. After scoring the cutline, hit your chisel with more force. Soon enough, the brick should break along your score. 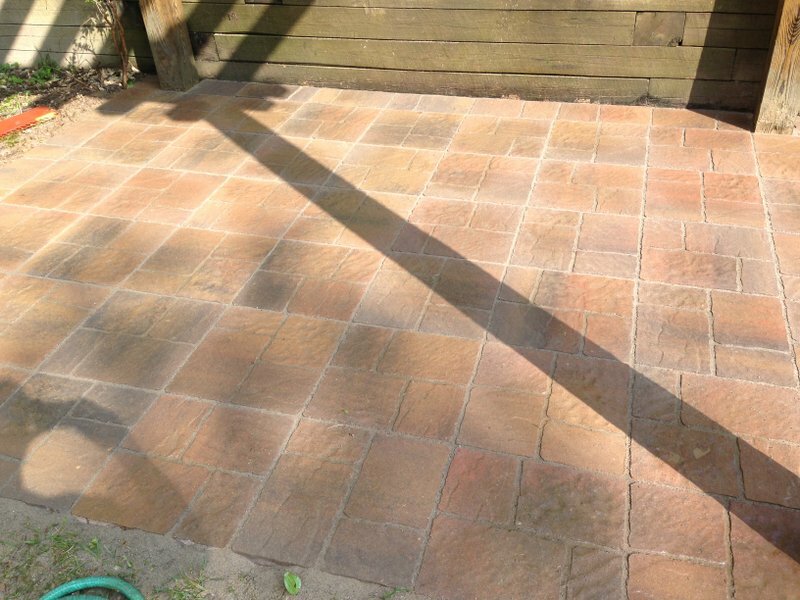 There are different types of sand you can use to finish a paver patio. For this project, we used polymeric sand. This type of sand helps hold your pavers together and also helps with weed growth. Pour the sand over your pavers and use a broom to sweep it in between the cracks. 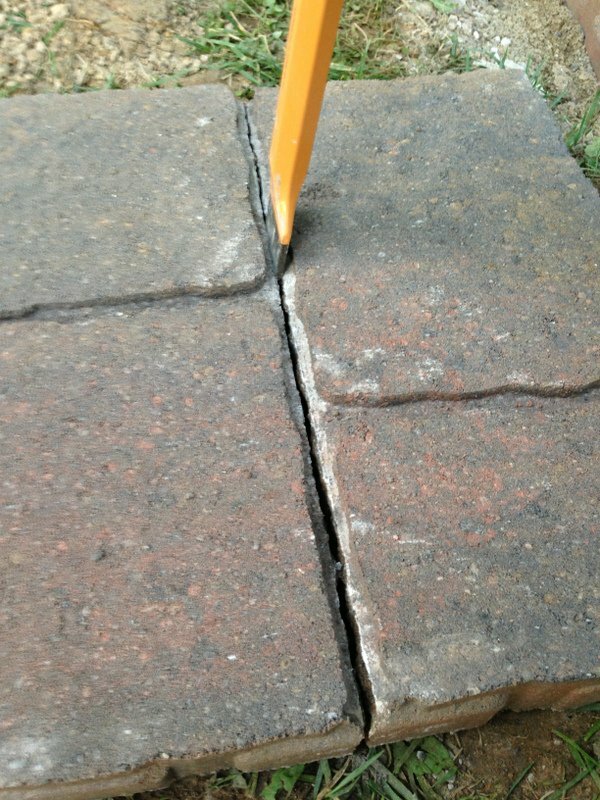 Repeat this process of pouring sand and sweeping until all of the cracks between your pavers are full of sand. Clear any excess sand from the top of your pavers. This is important, because any polymeric sand left on top of your pavers will stain the stone. Once you are done, use your hose to lightly mist your patio with water. Be careful not to wash the sand away between the joints. The amount of water may vary depending on the type of sand you use. Follow the instructions with the sand you choose in order to determine the correct watering amount. Lightly mist the patio to set the sand.